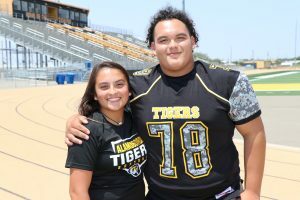 Just talking with Alamogordo’s Issac Duarte, you can feel his energy and enthusiasm about playing under the Friday night lights come through with every sentence. 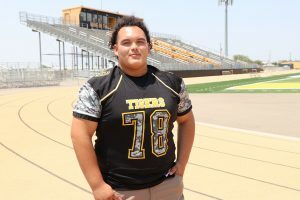 Duarte plays both ways for the Tigers. He is an offensive tackle and defensive end. “I prefer defense, it’s more physical.” He’s built for the game, too. Duarte is currently 5’10” and 305 pounds. 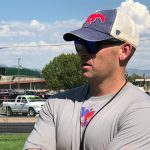 The junior says he was raised on football, watching family members take the field every week. You can tell family is a big focus and influence in his life. Issac has goals to play college football and pursue a career as an orthopedic surgeon. “Both my parents are in the medical field, so it inspired me. I enjoy helping people.” Issac has a 4.0 GPA and earned recognition as a Golden Scholar and a member of the National Honors Society. Issac’s sister Nyomi is a freshman at Alamogordo High School who competes in soccer and softball.